How to make pancakes? It's all about the batter. For fluffy pancakes you need self-raising flour or a raising agent. How to make pancakes better? Eat lots of them, smothered with Nutella, cream and topped with nuts and berries! 1. Blend the flour, sugar, eggs, milk, salt and 1 tbsp melted butter in a food processor for 30 seconds until smooth. Refrigerate for 1 hour, or until required. 2. Brush a frying pan with melted butter, then add batter by the tablespoonful, three or four at a time. Cook over medium heat for 1 to 2 minutes or until bubbles appear on the surface and base is golden. 3. Flip over and cook other side briefly, then remove and spread with Nutella while still hot. Repeat until you have 12 pancakes. 4. Beat the cream and icing sugar until thick. 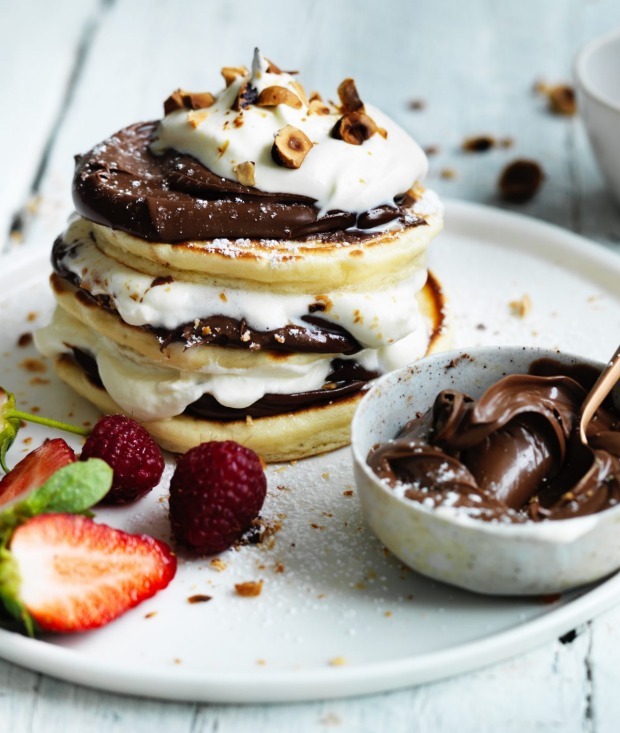 To assemble, top one pancake with a little whipped cream, place a second pancake on top and lightly press, then add more cream and the final pancake. To serve: Top with a little cream, berries and crushed hazelnuts. Dust with icing sugar and serve.